8AM-12PM (AM) Time Slot: From beginning of tournament to lunch time. 12PM-4PM (PM) Time Slot: From end of lunch time to end of competition. 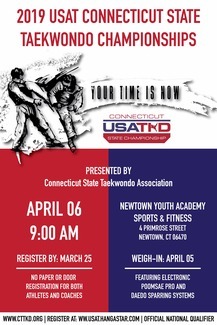 Referee Registration: Register at www.usat.hangastar.com. For those volunteers that are involved with WCT's Presidential Volunteer Service Award Program, make sure to record your hours for tournament volunteers and report it with your hours for the month of November. Contact [email protected] with any questions you may have. Help set up the tournament venue the night before the tournament date - setting up rings, tables, etc. Check athletes in and provide them with ID cards. Must attend training session at 7PM on April 06, 2018. Collect ticket payments and control who enters the competition area. Help Table Managers record and check all scores. Must attend training session at 7PM on April 06, 2018. Will help bring athletes from holding area to designated rings. Organize competitors at their report times and lead them to their rings at the event start time. Sell boards outside competition area to breaking competitors. Selling snacks outside competition area.